At the end of the last post, Grace and I had just finished our Trinity Alps trip when I received a voicemail letting me know I could come back and hike Mount Whitney. The Whitney Portal Road had closed because of wildfire the day Grace and I were supposed to start our hike, so the permit office was offering a seven day window to come back and try it again. Just like that, five days after our Trinity Alps trip, I was again packing for Mount Whitney. This time though, I was solo. At 14,505 feet, Mount Whitney is the highest peak in the lower 48 states. She's taller than Mount Rainier (14,411 feet), and yet unlike Rainier, she has a hiking trail to her summit: no technical mountaineering gear required. When the snow melts out, you can literally hike to the summit in sneakers. At the same time, it's a strenuous romp: 22 miles round-trip and 6400 feet cumulative elevation gain. Some day-hike it, but most prefer to camp to break up the distance and adjust to altitude. And then there's the reality of altitude sickness. At Mount Whitney's summit, oxygen is 58% of what it is at sea level. There's less pressure, air is less dense, and oxygen molecules are more spread out. This can cause hypoxia, a condition where the body's tissues aren't receiving enough oxygen, which in turn can lead to swollen hands and feet, dizziness, headaches, trouble sleeping, and vomiting. More severe forms of altitude sickness are High Altitude Pulmonary Edema (build-up of fluid in the lungs) and High Altitude Cerebral Edema (severe brain swelling). After reading stories of hikers who had gotten sick, I realized it was something I needed to take seriously and keep an eye out for during my trip. After spending the night in Independence, I drove to the Whitney Portal parking lot, hefted my backpack on, and began hiking the Mount Whitney Trail at 4:45 a.m. I felt like a kid sitting on a beach after eating lunch or an ice cream, waiting to go back in the water. A bouncing, excited energy sped through me and all I could think was that I was here! I was hiking the Mount Whitney Trail! For real! My body wanted to book it up the trail, but I forced myself to slow down. I had made a deal with myself not to exceed 1.5 miles per hour to help prevent altitude sickness. At 8,330 feet, starting a hike from the Whitney Portal parking lot is like starting a hike from the summit of Mount St. Helens (elevation 8,365 feet). So, instead of charging up the trail, I watched the canyon come into focus as dawn erupted over Owens Valley. Popcorn-like Sierra angelica swayed on tall, green stalks. It was warm for early morning hiking, about 70 degrees. I began seeing notches etched in tree bark: a small dash above a rectangle. Markers for hikers. At 7:00 a.m., I reached the junction for Lone Pine Lake (2.9 miles, 10,030 feet elevation). Turning left, I hiked down to the shoreline. The lake was beautiful, quiet, and peaceful. I recharged with an energy bar and just took in the scene for a bit. After a short rest, I made my way back to the Mount Whitney Trail. Soon after the Lone Pine Lake junction, I passed the sign for the Whitney Zone. Another mile revealed Bighorn Meadow, with Lone Pine Creek meandering through it to the north. Part of the trail was submerged underwater here, and I was glad I had on waterproof boots. On the western edge of Bighorn Meadow is Outpost Camp (3.9 miles, 10,365 feet), the first of two major camping areas in the Whitney Zone. This would be my home base for the next two nights. I hiked towards a waterfall in the southwestern corner and found a campsite nearby. Thankful the ground was sandy enough to stake my tent. I had brought rope in case the ground was too rocky to secure it. Looking out my tent to the waterfall. There was a stream nearby I used to filter water. I saw mice, chipmunks, and Steller's jays. The Mount Whitney Trail. At Outpost Camp, I was just over 1/3 of the way to Mount Whitney. After setting up my tent, I rested and prepared for summit day. I filtered water from a nearby stream and organized my gear. I cooked pad thai for dinner and "went to bed" at 6:00 p.m. My alarm was set for 1:15 a.m. I hoped for four hours of sleep. Throughout the night I tossed and turned, excited but scared I wouldn't hear my alarm. Thankfully, everything went according to plan as my alarm went off. I unscrewed my bear can to get my pre-packed food for the day, munched on a peanut butter Clif bar for breakfast, and began hiking at 1:45 a.m. My timing was based on advice from rangers to be off Trail Crest by noon due to seasonal thunderstorms that tended to roll in around that time. It was also based on a calculation in an excellent book called One Best Hike: Mount Whitney by Elizabeth Wenk. She suggested it would take 6.5 hours to reach the summit from Outpost Camp. I figured if I left at 1:45 a.m., I could summit by 8:00 a.m. That would give me a few hours to get back to a safer part of the trail in case a thunderstorm came in. I focused on maintaining a steady rhythm and sighting the trail, my hiking poles clicking on rocks. In a way, it was a like running a race: You're trying to get into a pace that's the fastest you can go without burning yourself out. In my case, I was trying to hike steadily at 1.0-1.5 miles per hour to prevent altitude sickness. Mostly, it came automatically. After hiking regularly for years, I can feel my usual 2.2 mph pace pretty well. Slowing it down a few notches worked to keep it under 1.5 mph. I also sipped water religiously, every 15-20 minutes, knowing it would also help prevent altitude sickness. At 3:45 a.m. 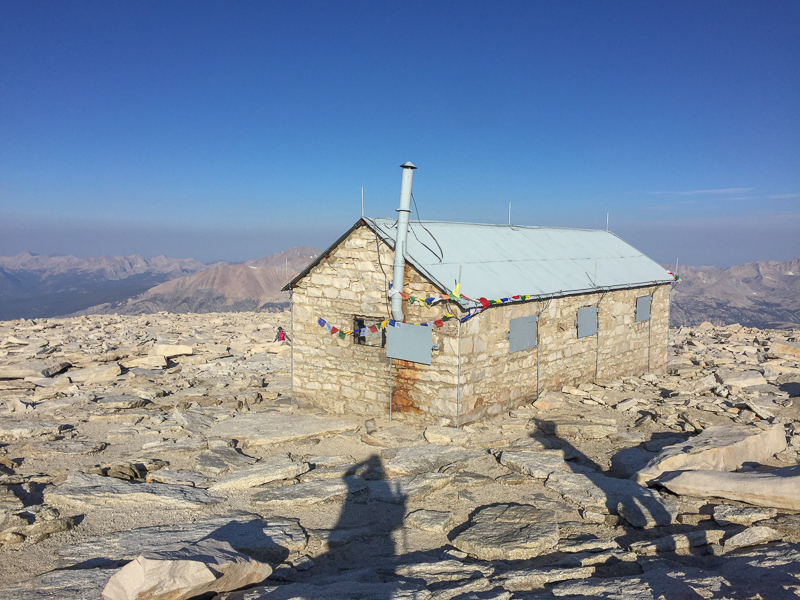 I arrived at Trail Camp (6.2 miles, 12,000 feet elevation), the second major camping area on the Mount Whitney Trail. Above me, tiny headlamps zig-zagged up the 99 switchbacks like fireflies on Lombard Street. As I hiked through Trail Camp, hikers were shuffling awake, firing up their Jetboils. I found a stream and filtered water to stock up on my water supply. Past this point, there is no water on the trail for the next 4.5 miles to the summit. What I could see in the dark. I followed the fireflies up the 99 switchbacks, heartened and motivated to have the company of hikers above me. We were all part of an "early morning wave" getting an early start for the summit. I listened to accents and languages from around the world, and occasionally asked people where they camped. Most had started from Trail Camp. One young woman carried a small day pack and was resting next to the trail. She looked tired, and asked me how much longer it was to the summit. I told her it was likely another 2.5-3.0 hours. She was disappointed she was going to miss seeing the sunrise from the summit. I was sad, in a way, in that moment. I could see her being disappointed if her goal had been to be at the summit for sunrise. At the same time, I tried to be encouraging, telling her she would still see the sunrise from this beautiful mountain. I also tried to be honest with her: I was tired too, just putting one foot in front of the other. I wished her luck, said goodbye, and moved on. I didn't see her again. At 5:15 a.m., after ascending 1600 feet on the 99 switchbacks, I reached Trail Crest (8.2 miles, 13,600 feet). Here you cross over the Sierra Crest, an imaginary line that runs north/south through the Sierra Nevada mountain range, dividing the west side from the east side. Now in Sequoia National Park, I headed north for the summit. Hiking along the ridge, I was astounded at the view west into Sequoia National Park. Rugged, carved mountains swept below and beyond for miles while the sun rose over Hitchcock Lakes and Guitar Lake. Many of us just stopped in the middle of the trail, mid-hike, watching the sky unfold in yellows and blues, pinks and purples. The last two miles to the summit were a one-mile-per-hour affair. It got chillier, and I put on my windbreaker and warm gloves. This section, a barren jumble of rock and pinnacles, felt like another planet. I began feeling the effects of altitude. My breathing changed and I involuntarily began taking a short inhale breath followed by a longer exhale. Quick slow. Quick slow. Quick slow. Quick slow. I also started feeling fatigued, and took 30-60 second rest breaks, even near the summit. The summit of Mount Whitney on the far left, Keeler Needle in the middle, Crooks Peak on the right. The trail is on the far right. Picking my way up the final slope, the Smithsonian Institute shelter soon came into view, and just like that, I was on the summit (11 miles, 14,505 feet). It was 7:15 a.m. and it felt like something surreal. Hikers were texting, FaceTiming, and calling friends and family. It was like a little summit party with people happily relaxing and taking in the views. One guy was strumming a ukelele, another eating a whole mango. I turned on my phone, hoping I would get reception to let Onur know I had made it. While I was waiting, I heard a ping. My cousin Chrissy had sent me a text of her kids playing on a keyboard that had somehow gotten through! Survey markers at the summit. I hopped among the blocky summit rocks, taking in the view from all angles. Anytime I heard someone say, "picture" I happily said, "I'll take it!" We were all experiencing the same achievement, and it felt like a common summit energy was coursing through us. After taking photos for a trio of women, I asked them to take mine. The Mount Whitney sign I'm holding was just sitting at the summit, open for people to grab and take pictures with. I later found out that Brian Milne, a writer and surfer in Southern California, had made the sign and brought it with him to the summit a few weeks beforehand. Thanks, Brian! It was everything I had hoped for, and at the same time, I knew I was only halfway. I still needed to get back down that mountain! So I refocused to my 1.0-1.5 mile per hour pace once again. My new goal was getting back safely to my campsite. But before I left, I took a quick peak inside the Smithsonian Institute shelter, built in 1909 for astronomers. Specifically, W. Wallace Campbell, an astronomer and the director of the Lick Observatory from 1901-1930, wanted to prove water vapor existed in Mars's atmosphere. It turned out that Mars would be close to Earth in August 1909, so he got the hut built, hauled up his instruments, and yes, verified that there were at least tiny amounts of water vapor in Mars's atmosphere. The shelter isn't used for research today, but is listed on the National Register of Historic Places. Summit hut. I have no idea what kind of shadow craziness is going on to my right. 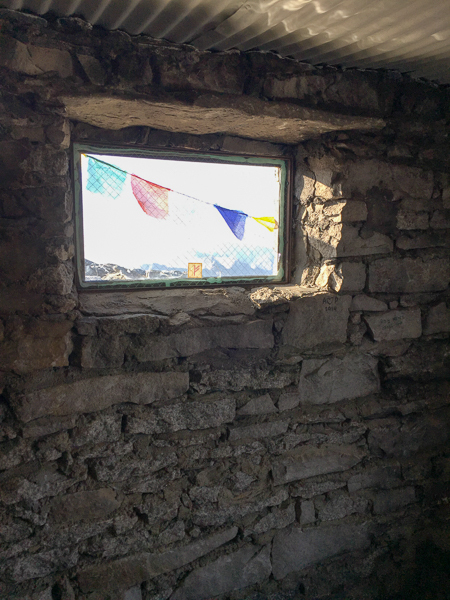 Looking out from a small vestibule in the hut. Coming back down the trail revealed a new and surprising world in daylight. I saw Consultation Lake for the first time, the peaks and pinnacles surrounding Mount Whitney, Trail Camp, Trailside Meadow, and Mirror Lake. I loved it: It was like a shot of adrenaline seeing everything I had passed in the darkness for the first time. The trail winds up the spine of the ridge to the summit. The trail cutting south across the rocky slope. Hitchcock Lakes and Guitar Lake in sunlight. The junction of the John Muir Trail. Many JMT hikers drop their packs here before heading to the summit. The JMT approaches Mount Whitney from the west, the Mount Whitney Trail approaches from the east. They intersect here. Seeing the Trail Crest sign in daylight! Looking down at Consultation Lake on the right, and the lake at Trail Camp on the left. View from the 99 switchbacks. Sky pilot, a plant that grows at high elevations in the Sierras. Peaks and pinnacles surrounding Mount Whitney. A handrail on the 99 switchbacks for safety. Trail Camp below. Trailside Meadow on the right, hikers descending on the left. Trailside Meadow, roughly the halfway point on the Mount Whitney Trail. After soaking in all the scenery, I reached my campsite at noon. 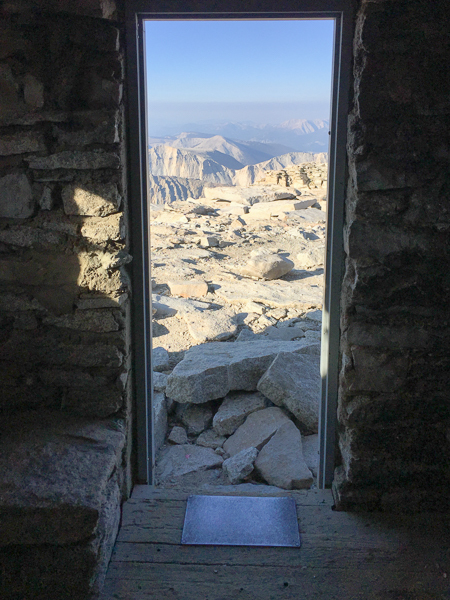 The 13.5 mile roundtrip, 4400-foot hike between Outpost Camp and Mount Whitney's summit had taken me 10 hours, 15 minutes. I washed and dried my clothes on rocks, napped in my tent, and listened to podcasts the rest of the day. That afternoon, the temperature cooled and I saw dark clouds roll in. I quickly grabbed my sun-dried clothes and went inside my tent, watching rain splatter on my tent fly for the next two hours. Then, just as quickly as it moved in, the shower moved on and the sky cleared. After my second night at Outpost Camp, I woke up at 6:00 a.m. and began getting ready to hike out. While I was brushing my teeth behind a shrub, a father and son approached me, asking where the Mount Whitney Trail was. Spitting out my toothpaste, I told them the trail was on the opposite side of Outpost Camp. If they headed directly north, following the rock wall, they'd hit a stream and beside it, the trail. They thanked me and began heading in that direction. I carefully packed up my tent and began hiking out at 7:00 a.m. I was elated, partly because I accomplished my goal and partly because I could FINALLY hike above 2.0 miles per hour!!! Yay!! I booked it down the mountain, covering 3.9 miles in an hour and a half. Reaching the trailhead, I paused at the wooden archway and ceremoniously weighed my pack, like thousands of hikers before me. Once back at my car, I grabbed my duffle bag with soap and clean clothes and headed to the Whitney Portal Store next to the trailhead. They have a tiny shower in the back of the store, and you can pay $3 to use it. It's as you would expect a trailhead shower to be, but I wore crocs and it was fine. A fresh shower after a couple days is still a fresh shower! Grace and I had originally planned to get breakfast at the Alabama Hills Cafe in Lone Pine after we'd finished, so in homage to that plan, I stopped in and picked up a cheesy breakfast burrito to go. I hopped back in the car, exchanged texts with Onur, and began driving back to the South Bay, reaching home at about 5:00 p.m. 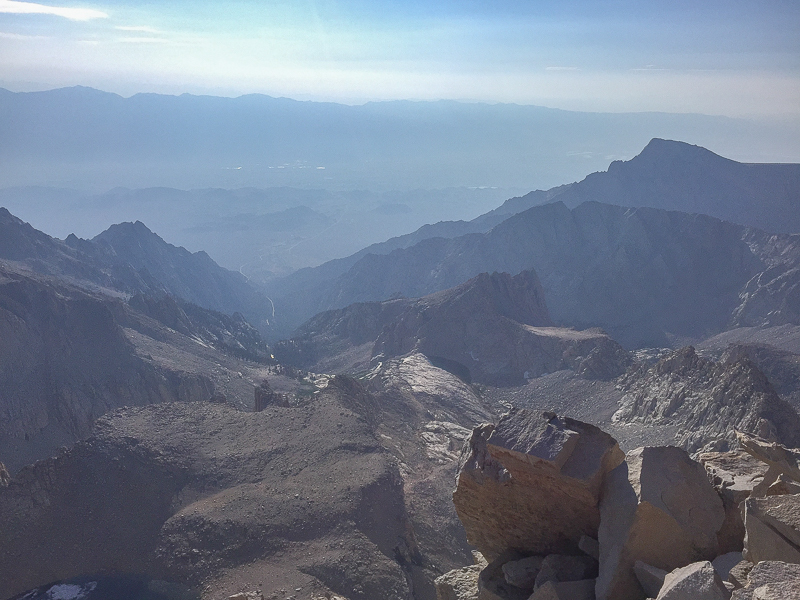 Hiking to the summit of Mount Whitney was more beautiful than I imagined. Many times, while I was pushing through fatigue to complete training hikes, I questioned whether I had reached too far. Maybe I shouldn't have set my sights so high so soon after moving to California. But looking back, I'm glad I set a difficult goal for myself. It gave me purpose in those first few, challenging months and it renewed my sense of confidence in what I'm able to do, on the mountain and off. So, now what? As far as peaks go, I've got my eye on Mount Shasta for next year, and maybe one or two in the coming months :) I'm also beyond stoked to share that I've signed on to write for Modern Hiker, a phenomenal hiking news and trails website in the American West. I'll be developing trail descriptions for them for hikes in the San Francisco Bay Area that will be published www.modernhiker.com, and penning articles for them too. I look forward to sharing more with you as I discover California. Thank you for sharing this journey with me, and thank you for reading!